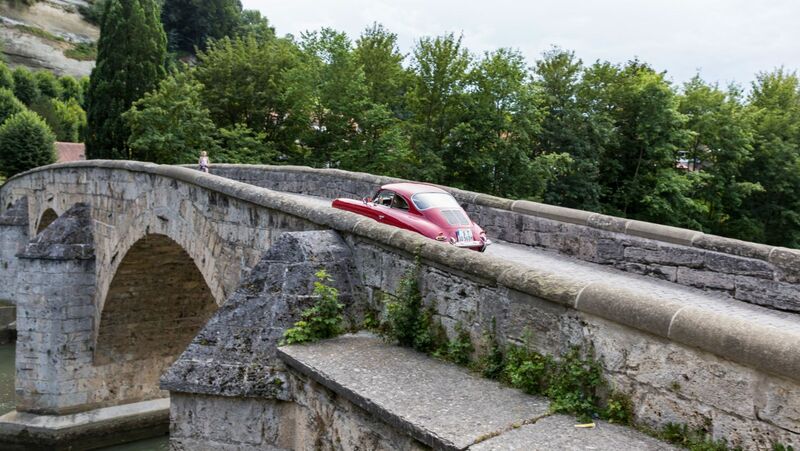 Switzerland played a leading role in the beginnings of the Porsche story: The 356 “No. 1” Roadster made its debut in the country’s capital city, the vehicle’s first appearance at a trade fair was in Geneva and its first owner lived in Zurich. 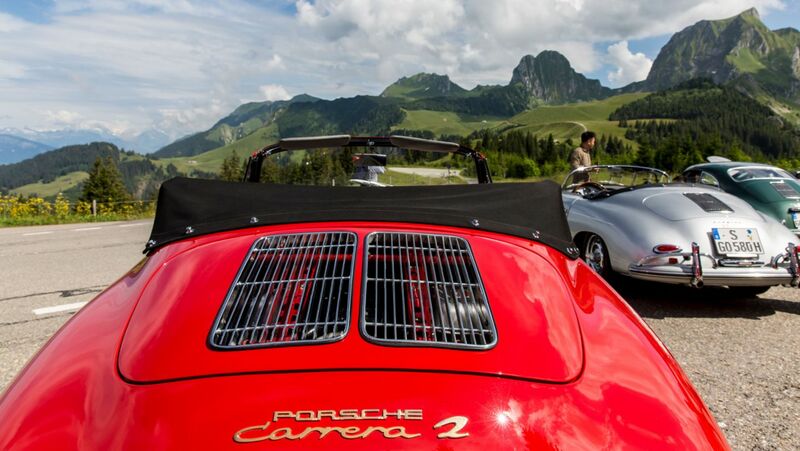 It is therefore only fitting that the 70th anniversary of the sports car was celebrated by driving the very first Porsche through the Bernese Highlands. The “Number 1” could be forgiven for being a bit daunted by this prospect, particularly given that the outdoor temperature had risen to an oppressive 31 degrees. 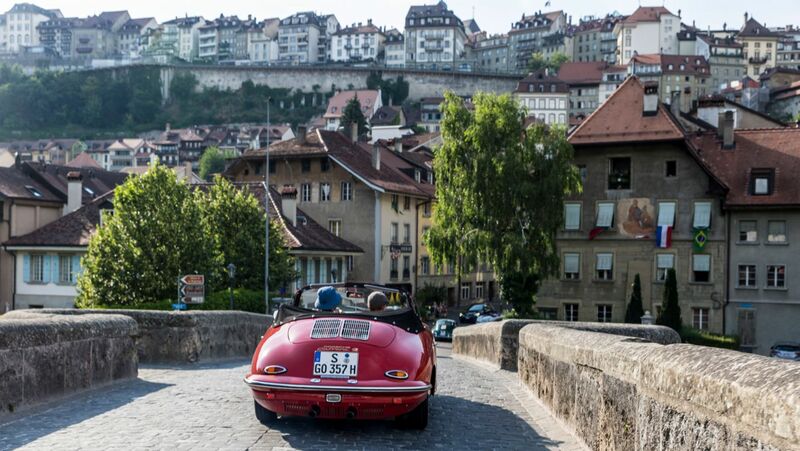 Even the traffic lights in the Swiss capital of Bern seemed to be against the very first Porsche, the mid-engine roadster from 1948, allowing what seemed like no more than three cars through each time that the lights turned green. By the time that the vehicle eventually reached the inclines of the Bernese Highlands, bubbles had already started to form in the fuel system, forcing the driver to give the car a break. The good thing about all these pit stops was the fact that it gave us more time with this unique relic from Germany’s largest sports car brand. The “Number 1” was returned to Porsche in 1958 and after a long period out of action the vehicle has been restored for use on the road. It was high time to get it back on the asphalt from its early years – and specifically the roads of Switzerland. The mid-engine purrs behind the occupants while at the same time generating an incredible amount of heat. Despite intermediate acceleration and double clutching, the unsynchronised four-speed transmission crunches slightly as it moves through the gears, while the speedometer needle dances to its own rhythm. From a technical perspective, there’s not much to write home about in the world’s first Porsche. An aluminium body has been hammered over a lattice tube frame and the axles, steering, wheels and brakes all originated from the VW Beetle, as did the 1.1-litre engine. At one time, Porsche did enhance the engine by 10 hp with the help of newly constructed cylinder heads, although the output was still just 35 hp. However, the engine needs to move just 585 kilogrammes of vehicle weight, enabling a maximum speed of at least 135 km/h. The engine still bears the original number. During its tour through Switzerland, the “Number 1” is flanked by four other classics: a 356 A 1600 S Coupé, a 356 B 1600 Super 90 Coupé, a 356 A 1600 S Speedster and one of the ultra-rare 356 B 2000 GS Carrera 2 Cabriolets with a Fuhrmann vertical shaft engine from 1962, of which only 34 were built. The convoy gets a lot of attention – perhaps because the “Number 1” is not recognised immediately by everyone. The “Number 1” actually began life as the “Type 356 VW sports car”, or the “VW Sport” for short. The idea for the vehicle was conceived back in the summer of 1947. And by February 5, 1948, Ferry Porsche took his place behind the wheel in the new chassis for the first time. This first outing actually took place in the Austrian town of Gmünd as the Porsche company had been ordered to leave Germany in 1944. Ferdinand Porsche re-embraced his Austrian roots and moved his business across the border. It was also at this point that the connection between the “Number 1” bodyshell and Switzerland first cropped up: During those post-war years, lightweight metals were incredibly difficult to get hold of in Austria, but not in Switzerland. In return for his sales permit, Porsche had to promise the government in Vienna that the vehicle being made of this precious commodity would be sold abroad – Austria needed foreign exchanges. However, it was several months before the car was stable and ready. In fact, before even completing the “No. 1”, Porsche had already started constructing the 356 series models, which featured a rear engine rather than the mid-engine. In spite of this, Porsche chose not to assign the series a new development number, no doubt because he was already busy with other designs, such as the Type 360, the Cisitalia racing car. When the time came to present the “Sport 356/1” as the roadster was officially known, Porsche looked to Switzerland once again, choosing the surroundings of the popular Swiss Grand-Prix held at Circuit Bremgarten, which was already teaming with representatives from the trade press. It was here that the first journalists tested the car before the race on the 7.26-kilometre and incredibly dangerous track. The ever first driving report about a Porsche was thus published in the Swiss Automobil-Revue magazine on July 7, 1948: The report professed “full confidence” in the car, a “modern, low-slung, practical sports car”, suitable for “daily use by a sports driver but also for participating in sporting events...”, offering “control and stability in tight bends”. Suffering from a continuous lack of funds because the 356 models still in progress had to be pre-financed, Porsche eventually sold the “No. 1” in Switzerland. As the first road-approved Porsche, the vehicle received its ZH 20640 number plate on December 20. Peter Kaiser, a German architect living in Zurich, became the vehicle’s first private owner, paying CHF 7,500 for the privilege. Kaiser replaced the cable-actuated brakes with a hydraulic mechanism and tinkered with the “Porsche” signature to make it read “Pesco”, the idea being that it sounded Italian and therefore would not function as advertising for Porsche. Due to various problems with the vehicle, he sold it to a car dealer about a year later. After that, this unappreciated classic changed hands in Switzerland every couple of months until sports car fan Hermann Schulthess discovered the treasure in 1952. Schulthess got Porsche to install new brakes and convert the engine to 1.5 litres so that he could take part in Swiss slalom events, which he did until six nuns in an Opel drove into the back of him during an trip up into the mountains. He used the significant repairs required as an opportunity to make further enhancements, including larger wheel arches and round tail lights. After further changes in ownership, the “No 1” eventually made its way back to Porsche – owner Franz Blaser received a brand new 356 Speedster in exchange for the original vehicle. At the time, Porsche was also thinking about manufacturing the new 356 sports car entirely in Switzerland. Series production in Gmünd was not really feasible, primarily for political reasons. As a result, just 52 chassis were built there. As it happened, the second Porsche, the 356/2, was sent to the Beutler bodyshop based in Thun in the Bernese Highlands in order to check the feasibility of a cabriolet version. Ernst Beutler was impressed: The first 1:1 drawings were created in July 1948. Porsche was delighted, and an order for another five units quickly followed. Even Porsche’s first trade fair appearance was in Switzerland: A Gmünd-Coupé (356/2-001) costing CHF 15,000 and a Beutler-Cabrio (356/2-002) costing CHF 17,000 stood polished to perfection on stand 11 in the main hall at the Geneva International Motor Show held in 1949. The associations with Switzerland began to taper off towards end of 1949 when Porsche decided to settle back in Germany rather than in the Alps. Porsche moved his newly founded “Porsche Konstruktionen GmbH” to a 600-square-metre hall belonging to “Karosseriewerke Reutter & Co. GmbH” in Stuttgart-Zuffenhausen. In return, Reutter received an order to build 500 steel bodies. From March 1950 onwards, the first 356 models were manufactured and the Coupé version was sold for 10,500 German Marks. We enjoy the last few kilometres in the “Number 1”, the engine purring once again now that it’s had a good ten minutes to cool down. Our heads tower over the two-piece windscreen, which was really only designed as a wind deflector. Jan Heidak (24), a mechanic at the Porsche Museum, gently manipulates the floor-mounted pedals, cautiously ensuring that the car can still perform its duties as a unique ambassador at Goodwood in the UK, Vancouver, California and China in celebration of 70 years of Porsche. The comparison drive demonstrates just how much the series 356 models differ from the “Number 1” – aside from the fact that the engine was moved to the rear for reasons of space. The oldest “younger” 356 here is the 1600 Coupé from model year 1956. All four gears are synchronised but the shifting behaviour is rather imprecise. The bowl-shaped steering wheel seems huge in comparison, the seats are like armchairs and the output of 60 hp has no trouble heaving the 850-kilogramme athlete. The heat also has no effect on it. The other 356 models are also not fazed: The later the model year, the easier the vehicles are to drive. The cream of the crop is the open-top Carrera 2 – its 130 hp just begging to show you what the car can do, while the powerful sound of the flat engine immediately lodges itself in your brain, never to be forgotten. And yet the same applies to our time in the unique “VW sport” – the first and only mid-engine-356 in the world. Peter Pohl is devoted to the task of overhauling and optimising the engine par excellence of the four-cylinder era.